A real-world investigation of one of our most urgent public issues. A compassionate America has spent more than $5 trillion on welfare programs over three decades, but the poor haven’t vanished, and the self-destructive behavior that imprisons many in poverty has become an intergenerational inheritance. Drawing on City Journal’s superlative reporting, What Makes Charity Work? shows in concrete and compelling detail how government assistance to the poor is doomed to failure because it treats them as victims of forces beyond their control, robs them of a sense of personal responsibility, and neglects the virtues they need to escape poverty. 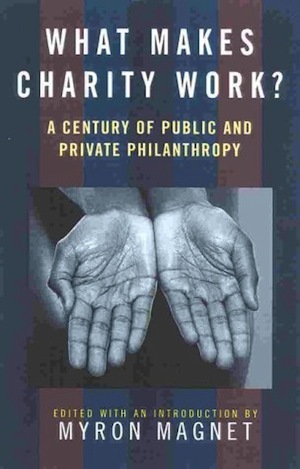 Contrasting case studies of charities both old and new show how charity can succeed spectacularly when it encourages the poor to take control of their own lives and teaches them habits of self-reliance and the traditional virtues. Here are accounts of charities that follow these precepts and have not only brought individuals into the economic and social mainstream but have delivered whole classes of people from poverty and degradation into the middle class in a single generation. As welfare reform unfolds, and as the nation calculates how to implement the “charitable choice” provision of the 1996 welfare reform act that allows government to use private and religious charities in helping the poor, policymakers and concerned Americans will find both encouraging and cautionary case studies in What Makes Charity Work? Here is an urgent issue considered in vivid, practical, and unfailingly absorbing fashion. Buy What Makes Charity Work?